For those looking to buy or lease a new Honda in Toms River, you’re in luck! Honda of Toms River is proud to offer our customers a variety of Honda lease specials and financing deals. Whether you’re looking to lease a new Honda Accord, finance the new Honda Civic, or you’re interested in another Honda model altogether, we have you covered! 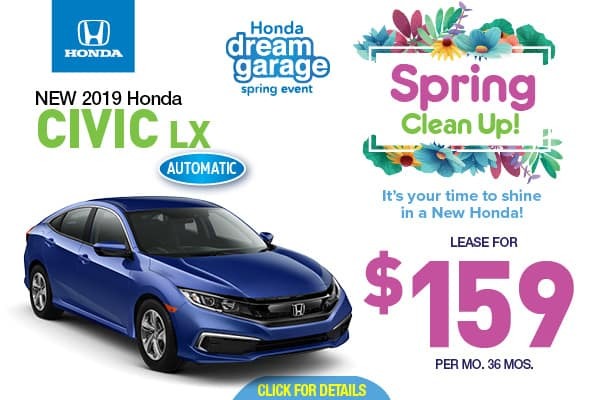 Browse these currently available Honda special offers, and then contact us to learn more about how you can drive home in a new Honda today. EXTENDED: Lease one today for only $159.00 per month! All colors now in stock, stop in today! Closed end lease for 2019 Honda Civic Sedan CVT LX (KH508338) through, April 20, 2019 to well-qualified lessees approved by Honda Financial Services. Not all lessees will qualify. Monthly lease payment of $159 for 36 months based on MSRP of $21,145. $2,500 cash due at signing is based on $2,000 down payment, Included $595.00 acquisition fee, Included 1st-month payment of $159.00 and $0 security deposit. Total due at inception/Total payments/Total Cost: $2,500/$5,940/$8,440 Purchase option at lease end (excluding tax, title, and other government fees) is $12,687.00. Price includes all cost except for tax, etch, dealer fees and any dealer-installed options. Documentary Fee of $498 Included.$500 Honda Graduate Program applies toward any new 2017 or newer model year Honda when financed through HFS. $500 Honda College Graduate Bonus Program must be used towards down payment assistance. Customer responsible for over mileage, excess wear and tear, maintenance, and any fees due on lease turn-in. Any single offer may not be combined with other offers and all offers and promotions in lieu of any other discounts or promotions. Not responsible for typographical errors. Closed-end leases for 720+ FICO score. Subject to primary lender approval. Leases incl. 10K mi/yr at .15 each add’l mi. Customer responsible for over mileage, excess wear and tear, maintenance, and any fees due on lease turn-in. Any single offer may not be combined with other offers and all offers and promotions in lieu of any other discounts or promotions. Not responsible for typographical errors. See dealer for details. The fee of $350 at lease end. Offer valid for in-stock vehicles thru 4/30/2019. Call for details. EXTENDED: Lease one today for only $299 per month! All colors now in stock, stop in today! Closed end lease for 2019 Honda Odyssey LX (KB045166) through, March 31, 2019 to well-qualified lessees approved by Honda Financial Services. Not all lessees will qualify. Monthly lease payment of $299 for 36 months based on MSRP of $31,085. $2,500 cash due at signing is based on $2,000 down payment, Included $595.00 acquisition fee, Included 1st-month payment of $299.00 and $0 security deposit. Total due at inception/Total payments/Total Cost: $2,500/$10,767/$13,267 Purchase option at lease end (excluding tax, title, and other government fees) is $17,718.45. Price includes all cost except for tax, etch, dealer fees and any dealer-installed options. Documentary Fee of $498 Included.$500 Honda Graduate Program applies toward any new 2017 or newer model year Honda when financed through HFS. $500 Honda College Graduate Bonus Program must be used towards down payment assistance. Customer responsible for over mileage, excess wear and tear, maintenance, and any fees due on lease turn-in. Any single offer may not be combined with other offers and all offers and promotions in lieu of any other discounts or promotions. Not responsible for typographical errors. Closed-end leases for 720+ FICO score. Subject to primary lender approval. Leases incl. 10K mi/yr at .15 each add’l mi. Customer responsible for over mileage, excess wear and tear, maintenance, and any fees due on lease turn-in. Any single offer may not be combined with other offers and all offers and promotions in lieu of any other discounts or promotions. Not responsible for typographical errors. See dealer for details. The fee of $350 at lease end. Offer valid for in-stock vehicles thru 4/30/2019. Call for details. 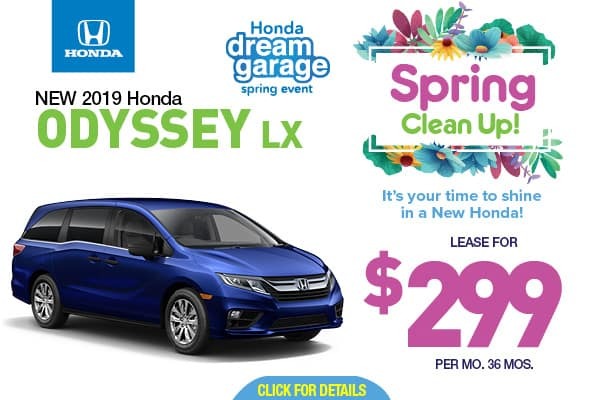 Special APR offers valid on new and unregistered 2019 Odyssey models through, April 30, 2019, to well-qualified buyers on approved credit by Honda Financial Services through participating dealers. Must take new retail delivery on vehicle from dealer stock by April 30, 2019. Not all buyers may qualify. Higher rates may apply for buyers with lower credit ratings. EXTENDED: Lease one today for only $219 per month! All colors now in stock, stop in today! 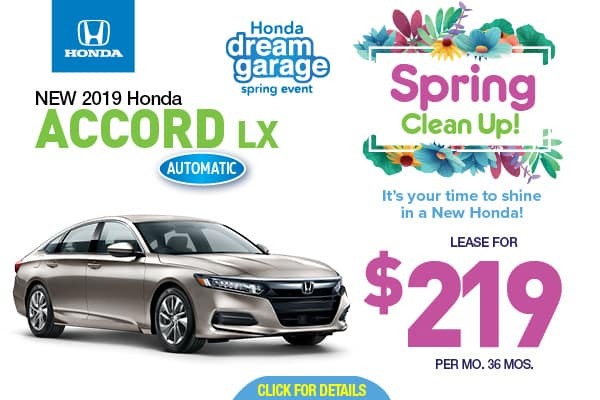 Closed end lease for 2019 Honda Accord LX (KA045166) through, April 30, 2019 to well-qualified lessees approved by Honda Financial Services. Not all lessees will qualify. Monthly lease payment of $219 for 36 months based on MSRP of $24,460. $2,500 cash due at signing is based on $2,000 down payment, Included $595.00 acquisition fee, Included 1st-month payment of $219.00 and $0 security deposit. Total due at inception/Total payments/Total Cost: $2,500/$8,244/$10,744 Purchase option at lease end (excluding tax, title, and other government fees) is $14,537.60. Price includes all cost except for tax, etch, dealer fees and any dealer-installed options. Documentary Fee of $498 Included.$500 Honda Graduate Program applies toward any new 2017 or newer model year Honda when financed through HFS. $500 Honda College Graduate Bonus Program must be used towards down payment assistance. Customer responsible for over mileage, excess wear and tear, maintenance, and any fees due on lease turn-in. Any single offer may not be combined with other offers and all offers and promotions in lieu of any other discounts or promotions. Not responsible for typographical errors. Closed-end leases for 720+ FICO score. Subject to primary lender approval. Leases incl. 10K mi/yr at .15 each add’l mi. Customer responsible for over mileage, excess wear and tear, maintenance, and any fees due on lease turn-in. Any single offer may not be combined with other offers and all offers and promotions in lieu of any other discounts or promotions. Not responsible for typographical errors. See dealer for details. The fee of $350 at lease end. Offer valid for in-stock vehicles thru 4/30/2019. Call for details. EXTENDED: Lease one today for only $209.00 per month! All colors now in stock, stop in today! Closed end lease for 2019 Honda HRV LX (KG711525) through, April 30, 2019 to well-qualified lessees approved by Honda Financial Services. Not all lessees will qualify. Monthly lease payment of $209 for 36 months based on MSRP of $22,915. $2,500 cash due at signing is based on $2,000 down payment, Included $595.00 acquisition fee, Included 1st-month payment of $209.00 and $0 security deposit. Total due at inception/Total payments/Total Cost: $2,500/$7,740/$10,240 Purchase option at lease end (excluding tax, title, and other government fees) is $14,207.30. Price includes all cost except for tax, etch, dealer fees and any dealer-installed options. Documentary Fee of $498 Included.$500 Honda Graduate Program applies toward any new 2017 or newer model year Honda when financed through HFS. $500 Honda College Graduate Bonus Program must be used towards down payment assistance. Customer responsible for over mileage, excess wear and tear, maintenance, and any fees due on lease turn-in. Any single offer may not be combined with other offers and all offers and promotions in lieu of any other discounts or promotions. Not responsible for typographical errors. Closed-end leases for 720+ FICO score. Subject to primary lender approval. Leases incl. 10K mi/yr at .15 each add’l mi. Customer responsible for over mileage, excess wear and tear, maintenance, and any fees due on lease turn-in. Any single offer may not be combined with other offers and all offers and promotions in lieu of any other discounts or promotions. Not responsible for typographical errors. See dealer for details. The fee of $350 at lease end. Offer valid for in-stock vehicles thru 4/30/2019. Call for details. 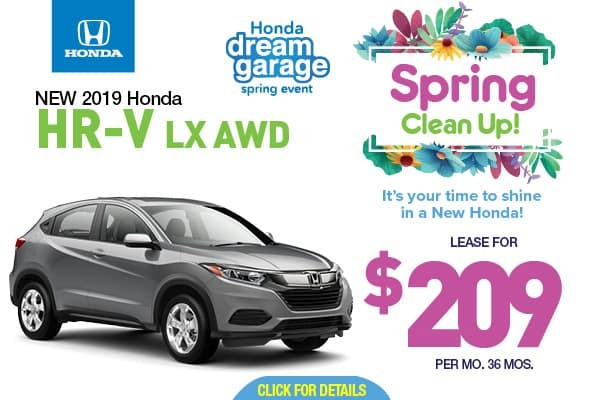 Special APR offers valid on new and unregistered 2019 HRV models through, April 30, 2019, to well-qualified buyers on approved credit by Honda Financial Services through participating dealers. Must take new retail delivery on vehicle from dealer stock by April 30, 2019. Not all buyers may qualify. Higher rates may apply for buyers with lower credit ratings. EXTENDED: Lease one today for only $239 per month! All colors now in stock, stop in today! 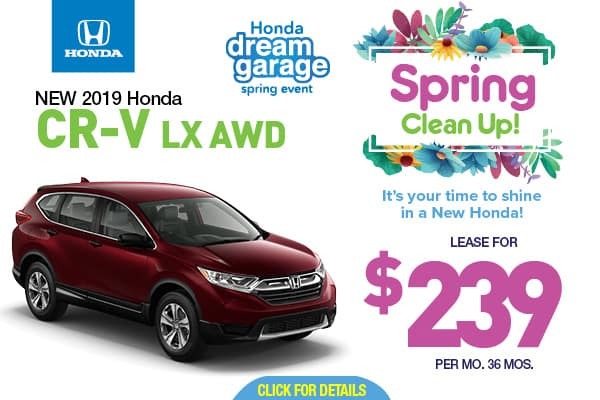 Closed end lease for 2019 Honda CRV LX (KH211232) through, April 30, 2019 to well-qualified lessees approved by Honda Financial Services. Not all lessees will qualify. Monthly lease payment of $239 for 36 months based on MSRP of $26,795. $2,500 cash due at signing is based on $2,000 down payment, Included $595.00 acquisition fee, Included 1st-month payment of $239.00 and $0 security deposit. Total due at inception/Total payments/Total Cost: $2,500/$8,604/$11,104 Purchase option at lease end (excluding tax, title, and other government fees) is $16,077. Price includes all cost except for tax, etch, dealer fees and any dealer-installed options. Documentary Fee of $498 Included.$500 Honda Graduate Program applies toward any new 2017 or newer model year Honda when financed through HFS. $500 Honda College Graduate Bonus Program must be used towards down payment assistance. Customer responsible for over mileage, excess wear and tear, maintenance, and any fees due on lease turn-in. Any single offer may not be combined with other offers and all offers and promotions in lieu of any other discounts or promotions. Not responsible for typographical errors. Closed-end leases for 720+ FICO score. Subject to primary lender approval. Leases incl. 10K mi/yr at .15 each add’l mi. Customer responsible for over mileage, excess wear and tear, maintenance, and any fees due on lease turn-in. Any single offer may not be combined with other offers and all offers and promotions in lieu of any other discounts or promotions. Not responsible for typographical errors. See dealer for details. The fee of $350 at lease end. Offer valid for in-stock vehicles thru 4/30/2019. Call for details. EXTENDED: 3 year Executive lease on the 2019 Honda Pilot LX for only $307 per month! Stop by and pick up your new Pilot today! Special APR offers valid on new and unregistered 2019 Pilot Sedan models through April 30, 2019 to well-qualified buyers on approved credit by American Honda Finance through participating dealers. Must take new retail delivery on vehicle from dealer stock by April 30, 2019. Not all buyers may qualify. Higher rates may apply for buyers with lower credit ratings. Why Choose to Lease or Finance a New Honda from Honda of Toms River? You’ve done your research, so you already know Honda zooms past the competition at every turn. With numerous models across the lineup that boast standard features like a rearview camera and dual-zone climate control and techy features like available Apple CarPlay, Android Auto, and the Honda Sensing package, choosing a new Honda is simply a smart bet. Add to that the Honda special offers you can take advantage of here at Honda of Toms River, and you’ve unlocked a winning combination! Visit our dealership today to learn more about how easy it is to finance or lease a new Honda, and be sure to take advantage of these Honda lease deals and Honda financing specials while you can—while you can always count on us for the best deals around, the specific deals above won’t last long!